Gift cards are available to buy from any cinema till at Movie House Coleraine and the receptions at Alley Cats, Superstrikes and Mini-Golf – Or you can buy them online right here! It doesn’t matter what activity. 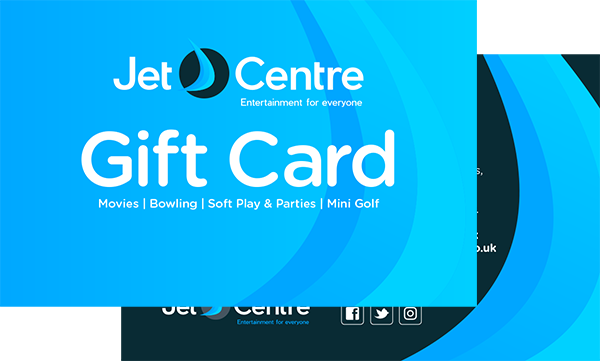 Treat someone special in your life to a Jet Centre Gift Card. Jet Centre Gift Cards all come with a gift card wallet so you can write a lovely message. Valid at Alley Cats, Superstrikes, Jet Centre Mini Golf and at any Movie House Cinema. Card expires 2 years from date of issue. Card cannot be refunded or used as payment for vouchers. Card remains property of Movie House Cinemas Ltd.